Just rec ently, after calling for an unexpected press conference that brought everyone to the edges of their seats in anticipation, NASA has announced the discovery of not one, not three, but seven exoplanets. Located nearly 40 lightyears away, the TRAPPIST-1 system consists of seven Earth-sized planets orbiting around a single star, an unprecedented number of exoplanets found in one system. 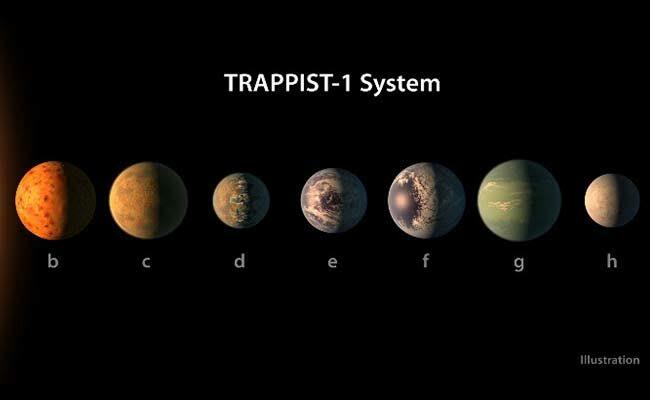 The discovery was made by a team of astronomers led by Michaël Gillon at the University of Liège in Belgium, using the Transiting Planets and PlanetesImals Small Telescope, TRAPPIST for short, where the star and its planets got their names from. Discovered using the “transit” method, where the planets block the brightness of their host star while orbiting, what was initially thought to be only three planets, was actually seven. “This is the first time that so many planets of this kind are found around the same star,” said Michaël Gillon, an astronomer at the University of Liège in Belgium and leader of the team who discovered the planets. Exciting for several reasons, NASA has said that there’s reason to believe that due to their size and proximity to their host star, the planets discovered within the TRAPPIST-1 system could be capable of supporting life. Suffice to say, this discovery has led to excitement and intrigue from not just the scientific community, but also the rest of the world, and ignited within us the dreams of reaching for the stars once more. While it’s not truly a step into the sci-fi fantasy of achieving interstellar travel, it has brought, once again, to the forefronts of our minds the possibility of it. Especially as most scientist would agree that the possibility of achieving space travel is not a question of “if” but “when”. Maybe not within our generation, or even within the century, but surely in the ones after. Which brings the question, how may we prepare our future generations for interstellar travel, if it truly is inevitable? Interstellar travel certainly won’t be achieved within our lifetimes unless there is an incredible jump in our current technology. Preparing future generations for when it happens would be the next best step, with the idea of space travel as a legacy for generations to come. Someday in the distant future interstellar flight will become less fiction and more reality, and what better way to prepare people of that eventuality than to normalize it. And what better way to do that, then through the gateway of education? If interstellar travel became a regular topic in everyday curriculum, not only would it no-doubt garner attention from a larger pool of students, but it would also lend a sense of achievability to the daunting idea of interstellar travel. Scientist should be encouraging the implementation of topics concerning interstellar travel within the general education system and utilizing it to generate interest within the minds of the youth. With the discovery of the TRAPPIST-1, we should take advantage of the sudden interest and strive to implement classes about space travel within school curriculums. In doing so, it would hopefully lend some credibility to NASA, as despite NASAs international acclaim – and large funding – many are still disbelieving and skeptical of their findings. After all, it seems illogical that information about NASA projects are not more widespread within the general public, and in normalizing such topics, the disbelief of naysayers might be assuaged. It might also lead to more accurate representations of interstellar travel within blockbuster movies. As a huge part of culture worldwide, and many of use manage to retain facts learnt from films much easily than through regular studying. If false information is regularly shown as fact in films, a large amount of people would accept that idea as the truth. In fact, some teachers regularly use films as teaching tools, and if concepts shown in films are false, students would become confused. Scientist have actually encouraged teachers to show the film Interstellar within school lessons as the visual effects and physics shown in the film have been proven to be scientifically accurate, which was the goal of the film’s producers. For every journey, there must be a destination. If our scientist could figure out a way for humanity to survive long term on a space ship while hurtling through empty space at what is hopefully the speed of light, there’s still the need for humanity to eventually land on a planet that could hopefully support life. But how would we be able to determine whether a planet is inhabitable? Scientist often look for planets that are most similar to Earth when looking for signs of life in space. Somewhat egotistical of humanity, it is also the most logical option. While it’s possible that other life forms could have formed and evolved under different conditions or environments, the only available data point concerning intelligent life in space would be us, humans. Within the extremely limited sample size they have, the only surety available are the conditions that gave Earth life, and it wouldn’t be a stretch to say that other planets with the same conditions could also be able to sustain life. The main source of all life on Earth is water, so scientist usually take the availability of liquids as the first sign of habitability. This is one of the reasons the TRAPPIST-1 system is so exiting, while other planets that are similar to Earth have already been discovered, the TRAPPIST-1 system has an unparalleled number of exoplanets with the added bonus of being close enough that it can observed through our telescopes. TRAPPIST-1e, f, and g are located within what is called the Goldilocks zone, where the temperature is “just right”. NASA suspects that these three planets are most likely to be rocky in formation, instead of gaseous, and are the most likely to contain liquid, or even whole oceans on their surfaces. Their host star, the TRAPPIST-1, is quite small, and is categorized as an ultracool dwarf star. About the same size as Jupiter, and much cooler that our sun. Despite being so close to their host star, this actually works in favor of these planets. As the TRAPPIST-1 is much cooler, to get heat from the sun the short distance is actually advantages to them. But there’s a downside to this as, due to the planets proximity to each other are, they are probably tidal locked which means they are unable to spin on an axis, and therefore not have day and night cycles, much like our moon. But despite these setbacks, scientists are still studying the TRAPPIST-1, hoping to determine if life found a way on planets TRAPPIST-1e, f, and g by observing the planet’s atmosphere. While they are not optimistic, there is still a shot. Are human beings alone in the universe? Sometimes, it seems likely. But isn’t that a terribly lonely thought, to think that out of so many billions of stars and solar systems out there in the ever-expanding universe that we live in, so unfathomably vast and unexplored, our planet, out of so many others, would be the only one with conditions optimal enough for life to flourish. Some people would prefer it that way, to say that at least we exist, content with keeping the idea of aliens in fiction and leaving it at that. There have been countless attempts to communicate with life outside our own planet, hoping against hope that the messages we’ve sent out into space will receive replies. So far, there have been no responses. But that doesn’t mean that humanity has given up. If no one is responding, we just have to go look. Scientist haven’t given up on searching for signs of life on other planets, and many have taken the discovery of the planets on the TRAPPIST-1 as a positive sign, a step in the right direction. There comes a thought however, that the reason we haven’t received any responses may be due to the distance between planets. The nearest Earth-like planet is the also recently discovered Proxima b, that orbits the Proxima Centauri, the star nearest to our sun. when compared to the vastness of space, the planet is “only” 4.2 light years away, close enough yet still uncomprehendingly far. It would take space probe New Horizons, the fastest space craft ever built at 14.31 kilometers per second, about 54,400 years to reach the Proxima Centauri. In a queer sense of time travel, what we see through telescopes aren’t actually in “real time”, as the time taken for our telescopes to view distant planets and stars depend on the speed of light. Interestingly, radio waves travel at similar speeds, and whatever radio transmissions sent through space would take the same amount of time to reach its destination. As radio waves never stop travelling, whatever music that has ever been broadcasted to radios all over the world are at this moment still travelling farther and farther into the universe. It can be safely said that if there was intelligent life out there, presently there are no conceivable ways for us to properly converse with them due to what is lacking in our own technology. And in the event that we could reach them in a straightforward way, there are no guarantees that we would even understand them. And of course, space travel most likely won’t be achieved within most of our lifetimes, at the moment, even the ability to observe these planets is already the most exciting thing. But, even if we personally won’t experience space travel on a commercial scale firsthand, future generations will be able to, which brings the question of how do we prepare them for it. This article was written by Ngo yi Ern from iPrice group, a price comparison and meta-search engine based in Malaysia, Singapore, Philippines, Thailand, Vietnam, Indonesia and Hong Kong.